← In a deck of cards the king of hearts is the only king without a moustache. The above print comes from Bjorn Bauer for a True Widow show at Norman Music Festival. 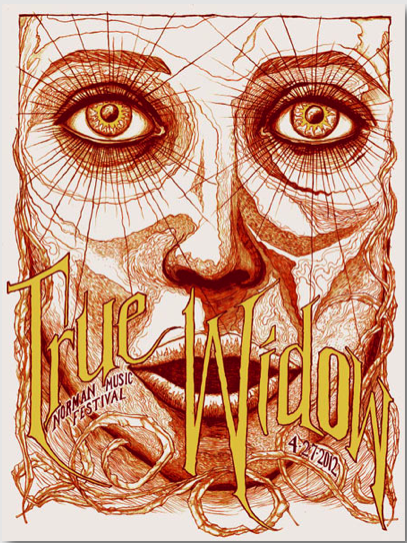 Bjorn Bauer design is fitting to the style of music True Widow creates. The profile of a person looking at nothing while looking at everything coincides with True Widow’s style of slow tempo, down tuned psychedelic rock. The dense rough lines that create the details in the face contrast with the large amount of negative space creating distinction that follows True Widow’s Texas roots of humidity so heavy it lays low on top of the hot pavement masking everything. This entry was posted in Uncategorized and tagged Bjorn Bauer, Dallas, Gig Poster, Skull eyes, Slow tempo, Sludge, Southern, Texas, True Widow, Youtube. Bookmark the permalink.